Posted on November 8, 2018 by Kelleigh Korevaar in News by Kelleigh Korevaar. Here at MH HQ, we’re big fans of getting things done the most efficient and effective way we can. And that rings especially true when it comes to cooking. That’s why we stand by one thing when it comes to getting ripped (no, it’s not abs are made in the kitchen… okay it kind of is); meal prep. You know the drill. You can’t out train a bad diet and if you’re the typical MH guy, it means you’re constantly juggling work with family, friends, and training. It’s not uncommon that cooking falls down your list of priorities when there are so many quick, easy meals you can pick up to scoff down (if you really don’t have time, check out our list of our top picks for online food delivery services you need if you’re struggling to eat healthy). Here’s the thing though, cooking cuts calories, if done right. A study published in the International Journal of Behavioural Nutrition and Physical Activity found that people who eat more than five home-cooked meals a week are 28 percent less likely to have an overweight body mass index (BMI). They are also 24 percent less likely to have excess body fat than people who eat less than three home-cooked meals a week. All that, just because they cook their own meals. What’s more is that the study also found that people who cooked at home more frequently ate more fruits and vegetables daily than people who ate less than three home-cooked meals per week. So if you think you aren’t getting in enough vegetables and fruit, this may be why. So if you want to get cooking, lose weight, get healthier, get ripped, and maybe impress your partner or a friend or two, here’s what you should have in your kitchen. Yes, that thing your mom is famous for whipping out to make a stew. It’s actually one of the healthiest ways to cook meat. Plus the long process means that you can use cheaper cuts of meat because they are tenderised in the slow cooking process. The real win though? It requires little to no effort to make mass amounts of delicious tasting food, you just throw in your ingredients and a few hours later you’re good to portion it out into Tupperwares. 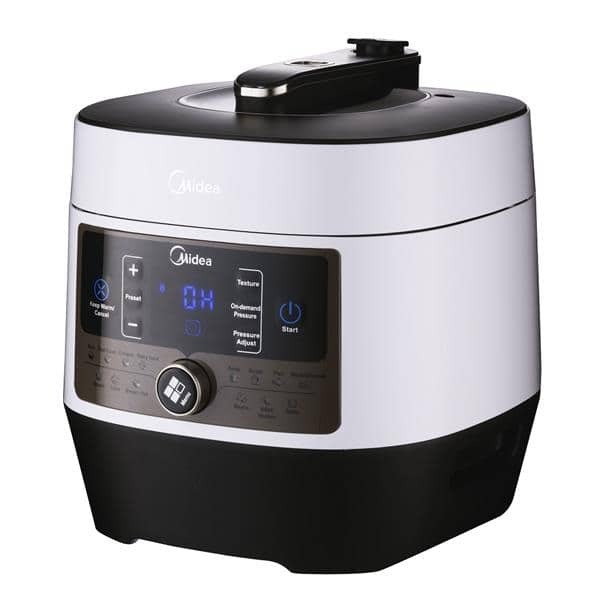 The Midea Instachef Pressure cooker is a great option. It has a Digital LED display wit 14 preset cooking functions and a 24 hour timer. Plus it has a 6l capacity which is perfect for the muscle meals you’ll be making. 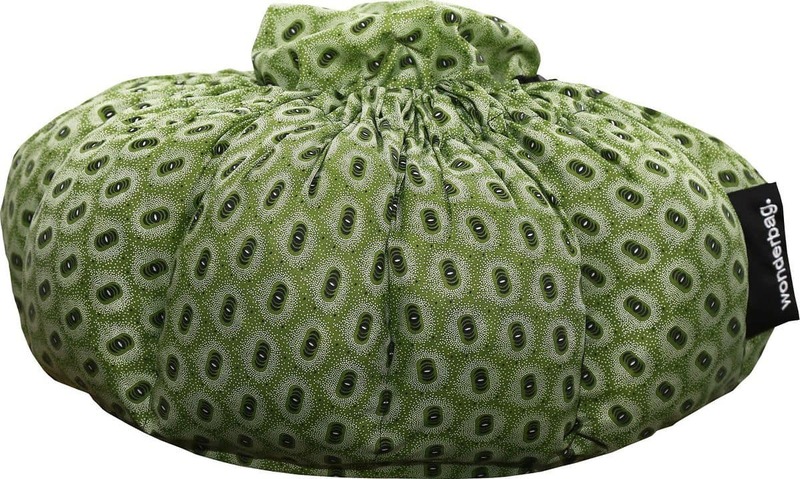 If you want to go “off the grid”, the Wonderbag is our pick, and not just because it is a local brand. It was named as one of the Time Magazine’s top 50 most genius products. All you do it bring your pot to the boil with all your ingredients in and then you pop it in the bag. It does the rest and without electricity, too. This bag will save you time, energy and effort. You’re probably struggling to get in enough vegetables and have reverted to using pasta, because it’s so quick and easy. Well this trend is worth the hype. By spiralizing your vegetables you create your own healthier version of pasta, and it’s not an unpleasant substitute you’ll be convincing yourself to like in the name of health. Using vegetables as a base adds another dimension of flavour, one that you just miss out on when you use bland pasta. So you’ll not only feel healthier, you won’t feel guilty at all and you will have a more flavourful meal. We’ve tested the manual spiralizers and whilst they’re easy on the wallet, they leave a lot of wasted vegetables and just aren’t worth the effort. 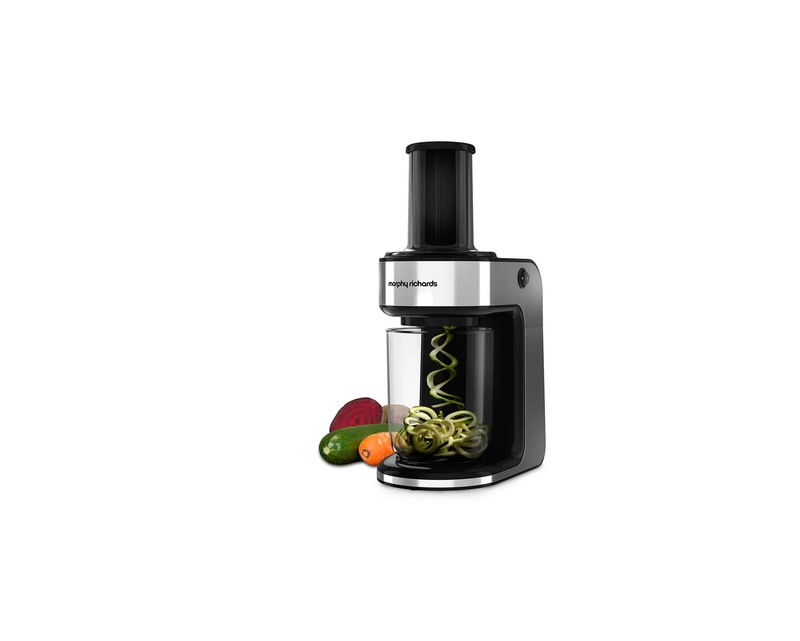 Spend a couple hundred more rands and you could get this bad boy, it will have you spiralizing vegetables for every meal because it’s so easy. It also looks pretty badass, too, which is a win in our books. Measuring out and weighing your food may seem like a tedious task that isn’t worth the effort. But actually, it really is and you could see some serious results by doing this. A survey of more than 6000 people found that those who measured their food were more successful at losing weight and keeping it off than those who didn’t. 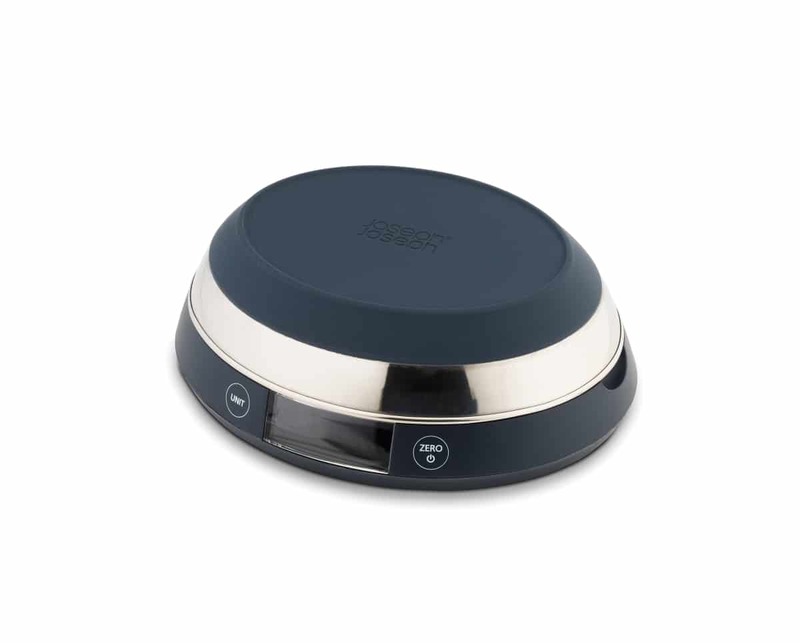 This scale is great because you can place food items directly onto the scale or flip the top and turn it into a measuring bowl. And it’s perfect to weigh liquids and dry foods. Steaming your food comes with benefits far beyond it being a cheap way to prepare food. You don’t need to add fats or oils and steaming softens the vegetables and fruit fibres making them easier to digest. They also retain their nutrients, vitamins, and minerals, where boiling would strip them. Overall steamed vegetables are a must-have on the plate of a muscled up man. Trust us on this one, we know. The Joseph Joseph Nest Steam Set is great if you don’t have a lot of space or don’t want to expand your appliance collection too much. 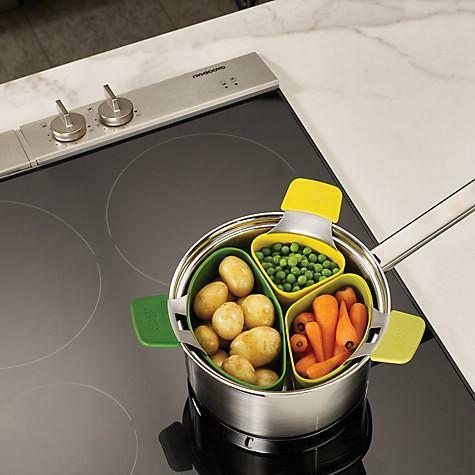 The individual pods let you steam a variety of foods simultaneously and the pods also have non-slip silicone handles and pan rests, as well as an integrated hook that suspends them from the edge of the pan. All you need is your pot, some boiling water, and you’re on your way to getting ripped. 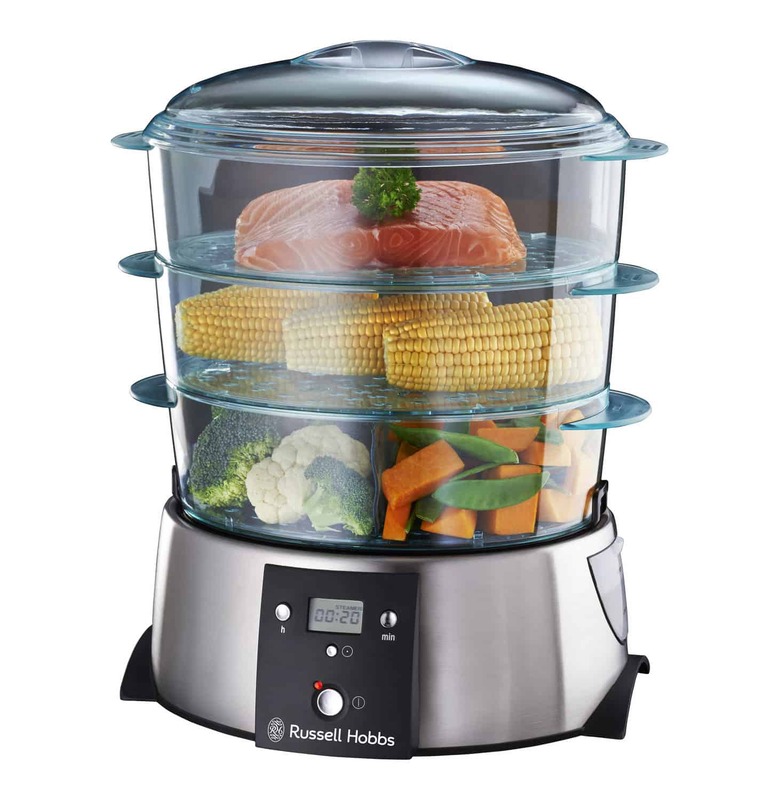 For an even easier meal prep session, we recommend the Russell Hobbs 3 Tier Steamer. You can make a three-course meal in one corner of your kitchen. It has 3 baskets, each with a 3L food capacity and there is a safe and easy water top-up feature which is usable while cooking. On top of that, it has a digital display with a 120-minute countdown timer, letting you preset your cooking time. Mastering meal prep doesn’t mean you will be doomed to a life of tasteless meals, in fact, it could mean quite the opposite. An air fryer means you can enjoy your favourite fried foods the healthy way. 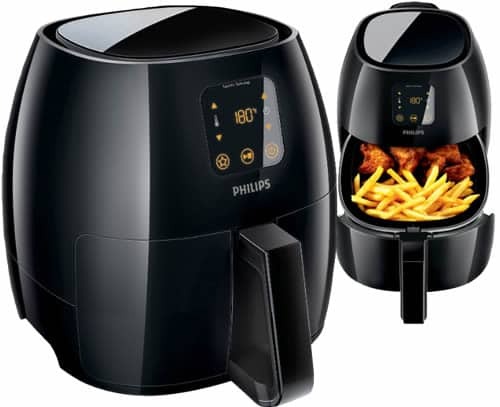 This extra large Philips Air Fryer has a 1.2kg cooking capacity so you can do your week’s cooking in one go. You’ll have less fat in your food and air frying is healthier than frying, baking, roasting, and grilling. Bonus? The digital control screen and pre-sets for your favourite dishes. Once you’ve made all your meals, you’re going to need to portion it out and package it, obviously. You have a few options here, you can use ziploc bags, glass containers or Tupperware. We’re not going to tell you what works best, that will have to be up to you based on your needs. 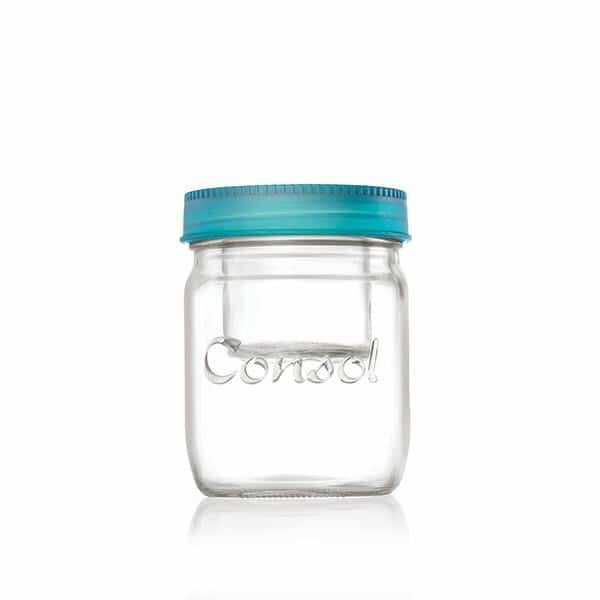 If you’re on the go and like to add sauces and toppings to your meals, the Consol Jar is ideal. You can put your salad in the jar and the dressing in the small one above it so your food doesn’t get soggy. Now there’s no excuse to take your own food to work. Of course good old plastic containers will do, and they have their place, especially when you’re freezing your chicken, broccoli and rice. We’re fans of the Joseph Joseph next storage set for this. The colourful, airtight lids have corresponding colour dots on the bottom of the containers for easy pairing. They’re also microwave and dishwasher safe. 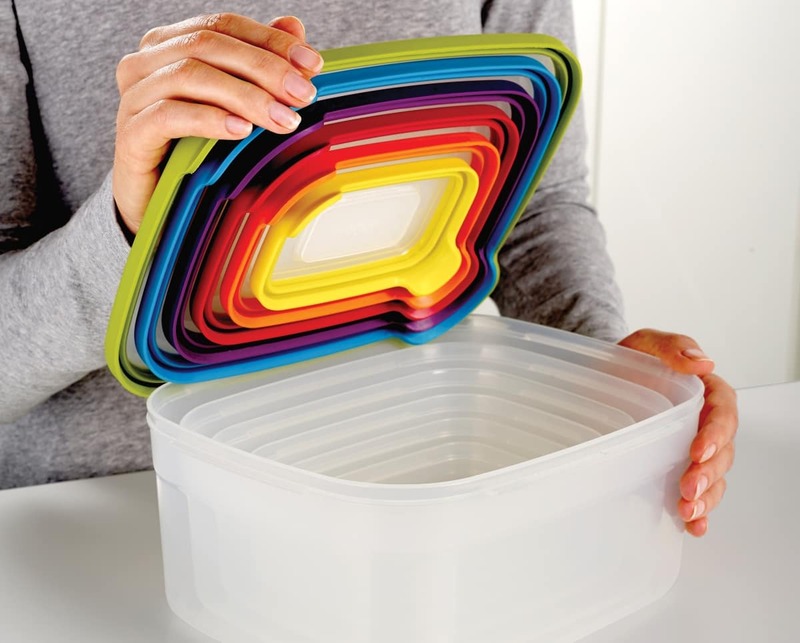 Plus, the container bases neatly stack inside one another so your Tupperware cupboard won’t look like an awful mess when you’re not using them. Bottom Line: Here’s the thing a lot of meal prep newbies don’t understand: meal prepping doesn’t mean you have to eat that meal for 5 days in a row. Keep 2 portions out and freeze the rest. You will end up wasting so much less food if you do that instead of leaving a massive bowl in your fridge, and you’ll also enjoy your meals instead of forcing down something you’re bored of. The post 6 Kitchen Appliances That Will Help You Master Meal Prep And Get Ripped appeared first on Men's Health.